Lifescape's goal is to provide best practices to preserve the landscape, one of the more important elements is architecture. In the case of Elbląg High-Plain Landscape Park these are primarily family houses. We developed a catalogue of 5 model-houses, harmonizing with the hilly landscape of the area and drawing on the historical heritage. They should serve as inspiration for new landlords, and as an alternative to conventional construction projects or the popular "mansions". 4th project meeting will be a working meeting dedicated to discussing the final results of the project and getting to know the Polish pilot area - Tolkmicko municipality. The currently prepared spatial plan for the Łęcze and Kamionek area was presented there. During spring Elbląskie High Plane Landscape Park team distributed 450 questionnaires about perception of landscape in the pilot area of Łęcze. Thanks to a very positive response 80% of the questionnaires could be collected A huge success! Results will presented on the meeting in Kadyny 15/16 May. Link to the online questionnaire can be found here. Thirteen artists took part in the interdisciplinary workshop and open air sessions organised by the Elbląskie High Plane Landscape Park. The concluding exhibition was shown in the EL art centre and gallery in Elbląg. The following artists took part: Rita Wójcik (painting), Patrycja Janta - Lipińska (painting), Ewa Niewolska (painting), Anna Taut (painting), Małgorzata Witschenbach (painting), Benedykt Kroplewski (painting), Zbigniew Opalewski (painting), Jerzy Kosacz (painting), Karol Patoleta (painting), Marek Świątecki (pastels), Krzysztof Kosecki (photography), Grzegorz Hryniewicz (photography), Waldemar Cichoń (sculpture). See also: press release, press release, and another press release. In winter 2011, a series of thirteen meetings with local stakeholders was organised by the Elbląskie High-Plain Landscape Park. The goal was to prepare the ground for the planned new 2013 spatial development plan of part of the Tolkmicko Municipality, which will be realised with funds from the LIFEscape project. Stakeholders were grouped in the following six focus groups: hunters and foresters, tourists, school children, residents, farmers and decision-makers. All meetings were received very positively and led to heated discussions about problems and importance of landscape in the High-Plain area. Common conclusions were that open landscape needs to be protected in order to secure both touristic value (views!) and life quality for local residents. Public space and small infrastructure such as hiking trails and picnic areas should be provided by the municipality. Horses should return to the meadows! Although most of us collaborated and met a couple of times before, the official start of the project was marked by a big conference organised by the lead partner, Elbląskie High Plane Landscape Park. The open event, entitled "Protection of valuable agricultural and natural landscapes in international experience" took place in the old Elbląg city hall. 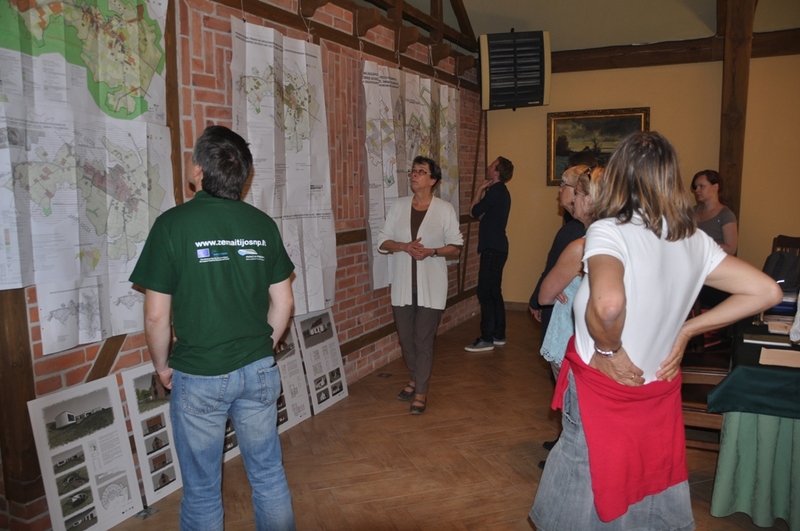 It was an occasion to introduce the project and present some of the partner's activities, as well as to learn about the Polish landscape planning system from invited experts.